Since elementary school I’ve had a desire to write stories, but a family and career took precedent over my ambitions to be a writer. After retirement, I became interested in genealogy and followed my family line to Scotland. Stories about the ancient Scots stirred my interest. A Highland Ruby is a result of research into my Scots heritage and Scotland’s history. My favorite character from fiction is Elizabeth Bennet from Jane Austen’s Pride and Prejudice. It's always wonderful to get to know more about an amazing author! All the best Brenda on your release! Thank you so very much, Melissa. I appreciate your support! 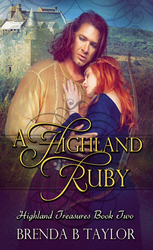 Thanks for hosting me on your lovely blog, Kayelle, and highlighting A Highland Ruby.